A remote coastal cottage; a group of old friends; the Christmas holidays. It's just the break Olivia needs to help her relax and forget her worries. What could be more perfect? But that was before she found a handsome unconscious stranger on the beach. Add in a case of mistaken identity, a lot of kissing practice, and an inquisitive best friend, and things begin to get more than a little complicated. The large bump on Adam's head hurts, but he refuses to go to the hospital—or back home—and eventually accepts Olivia's offer of hospitality. 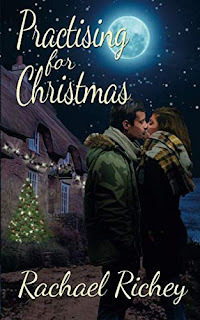 When her friends arrive the following morning, a chance remark catapults them both into a bizarre and amusing situation that promises to make it a Christmas to remember. I don't read a lot of chicklit these days but there are certain authors I make an exception for and Rachael Richey is one of them. As it's the 1st of December, I find it rather fitting to start the advent period with a review of a Christmas themed book. Olivia had planned the perfect getaway for the Christmas break: a cottage by the sea with her new boyfriend and best friends. Only she broke up with her boyfriend and she's dreading being alone at Christmas when her friends might think she made her boyfriend up in the first place. Olivia arrives at the cottage a few days early to get it ready for her guests and happens upon an unconscious man when walking on the beach one day. With a cut on his head, Olivia takes Adam back to the cottage to tend to his wounds and I could feel the air positively FIZZING with sexual tension. Despite her worries that he could be an axe murderer, Olivia offers Adam her couch for the night so she can keep an eye on his head wound. He's just about to leave when one of Olivia's friends arrive and presume he is Olivia's boyfriend, as she hadn't told them that they had broke up. Adam sees it as a bit of fun to go along with the ruse but there's nothing fake when he kisses Olivia - oh boy! Of course, things are never perfect and Adam has some secrets of his own...but if Adam and Olivia are meant to be, fate will find a way. I absolutely adore Rachael's Richey's books and her amazing ability to sweep me away with her gorgeous storylines; for anyone who believes in fate and believes that one day her prince will come, you will LOVE this book. It's not all sugar-coated and feel-good as there's a good dollop of real life hurt and disappointment in there, but I always know that I'm going to finish one of Rachael Richey's books with a smile on my face. Practising for Christmas is a fabulous feel-good festive frolic and the perfect book to curl up with by the fire on a dark wintery night. So whip up a hot chocolate and allow Rachael Richey to warm the cockles of your heart with this seaside Christmas treat.